A large portion of recent articles have been devoted to what you could call ‘deleveraging plays’. By that I mean companies which can probably generate solid shareholder returns simply by paying down their debt. Some good examples include the likes of Anheuser-Busch InBev, Molson Coors, AT&T and Kraft Heinz. There is one more I’d like to add to that list: media stock Discovery (NASDAQ: DISCA). This is the umbrella company responsible for well known TV assets like the Discovery Channel and TLC. Following its acquisition of Scripps Networks Interactive last year, we can now add the likes of Travel Channel, HGTV and Food Network to that list too. Discovery has quite a lot in common with the other four stocks I just mentioned. Firstly it owns very well known brands that are dominant in the media content space. In terms of ratings share only Disney, Fox and Comcast came out ahead of the combined Discovery/Scripps. More importantly it is a bona fide profit machine. Even after eliminating the costs of producing programming, the business of selling its channels to TV providers (as well as selling advertising slots) is a cash spinner for Discovery. The business converts somewhere in the region of 20% of its revenue into surplus cash each year. Secondly, the stock looks very cheap. As it stands we are looking at an EV/EBITDA ratio of around 8 on a trailing-twelve-month basis. That is the kind of valuation that implies relatively little downside unless earnings fall off a cliff. If analyst forecasts are anything to go on then that shouldn’t be a worry. On the downside Discovery has previously struggled for organic growth. It also has a fair bit of debt sitting on its balance sheet. To put some solid figures on that we are looking at roughly $17 billion worth of debt (net of company cash) versus annual profit of around $2 billion (2019 estimate). That low-growth/high-debt combination can be worrisome but at the same time can throw up some good opportunities by reducing the interest bill. The most important thing is to have an underlying business that throws off plenty of excess cash. In this case that isn’t an issue given company guidance points to $3 billion worth of free cash flow next year. Now at the moment the company is paying something like $750 million per year in annual interest on its net debt. On a per share basis that works out to around $0.95; quite a large figure when you consider that analysts’ average estimate for 2019 earnings clocks in around $3.50 per share. Imagine slashing that interest bill with difference flowing straight to the bottom line. 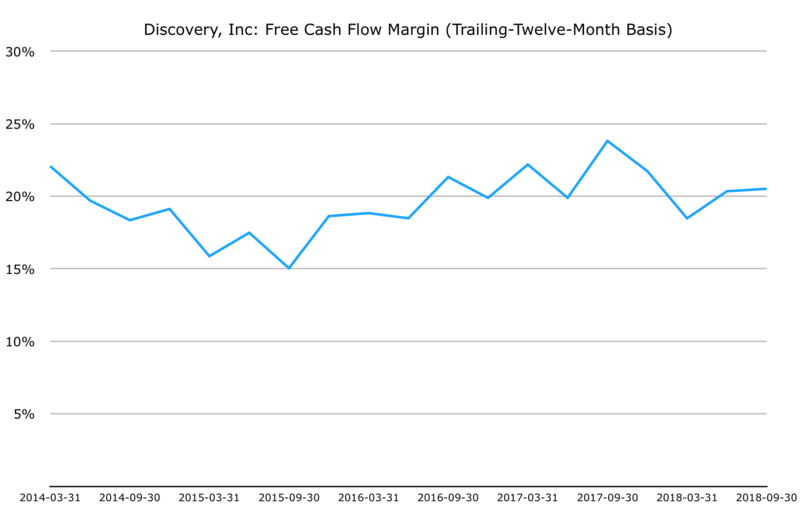 The good news is that the path to achieving that is very straightforward because Discovery doesn’t pay a dividend (and never has as far as I can see). The only thing it has done in recent times is buy back its own stock and acquire other businesses. 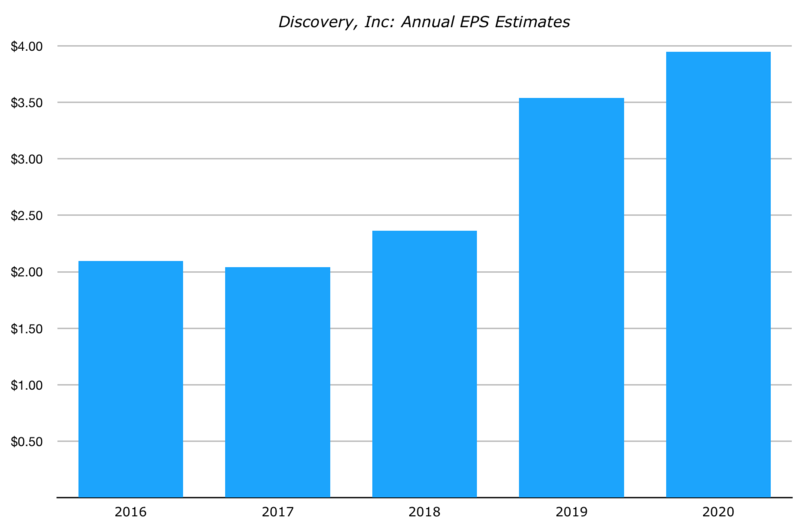 Further acquisitions aren’t likely to be on the table for a while for obvious reasons, which leaves just two outlets for Discovery’s surplus cash generation: net debt reduction and stock buybacks. Both will obviously act as a tailwind to earnings per share growth. Based on its current share price of $27.70 the stock sports a forward price-to-earnings ratio of just 8x. If you don’t mind the lack of dividend income then it has got to be worth a closer look.